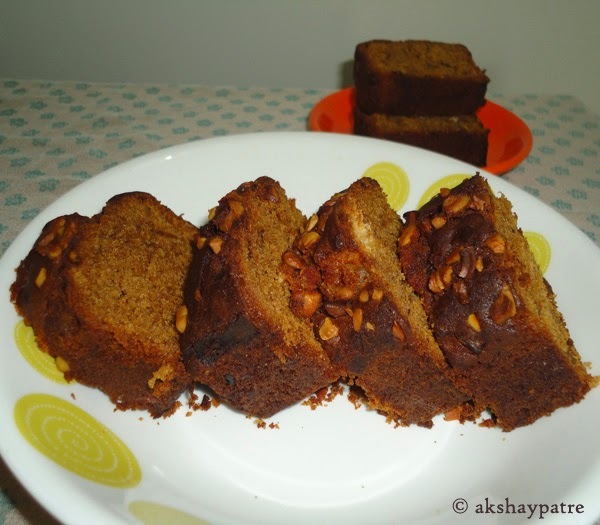 Eggless anjeer chocolate cake recipe - Do you have dried figs or anjeer in stock? 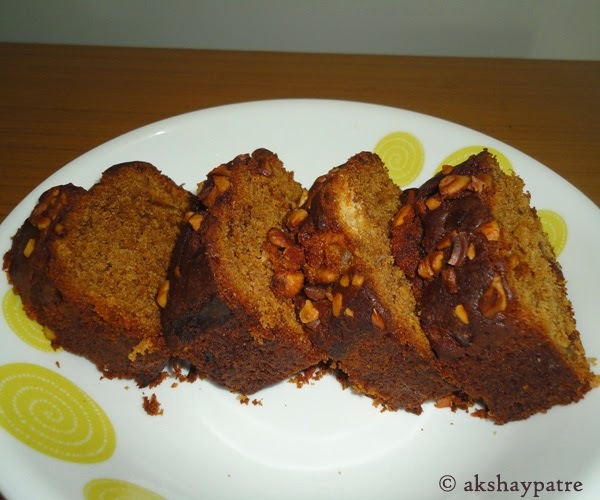 Here is a very simple yet delicious anjeer chocolate cake recipe for you. 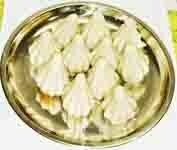 This is my all time favorite cake as I like both fresh and dried anjeers a lot. I have used few anjeers in cake and cashew nuts to garnish and baked a small cake. 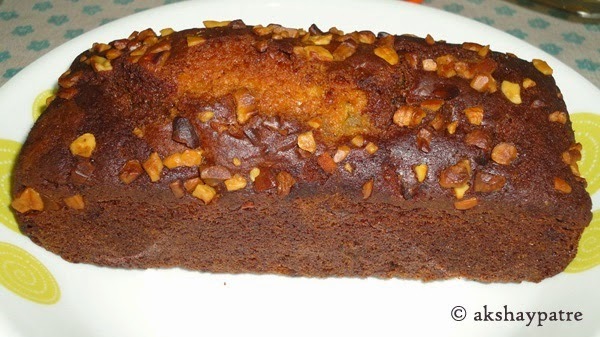 The cake was soft, light, delicious and it has melt in mouth texture. Wash and soak the dried figs in 1 cup of warm water for 15 minutes. Drain the water and put the anjeers in a mixer jar. Grind it to a smooth paste without adding any water and keep aside. Put the butter in a large bowl. Add warm milk and sugar and mix till the butter melts and sugar dissolve in the milk. Add the anjeer paste and mix to combine. Mix together the maida, cocoa powder, corn flour, baking soda, baking powder and sieve it. Mix the sieved flour to the anjeer paste and milk mixture. Fold gently. In the meantime, preheat the oven at 180 Degree Celsius for 10 minutes. Grease the cake tin with butter and dust with flour. Pour the cake batter in the greased cake tin. Garnish with broken cashew nuts. Bake in the oven at 180 Degree Celsius for 30 - 35 minutes. If a knife inserted in the cake comes out clean, the cake is ready. Rest in the oven for 5 minutes. Invert the cake mould on a plate and allow it to cool. Cut into pieces and serve. 1. Wash and soak the dried figs in 1 cup of warm water for 15 minutes. 2. Drain the water and put the anjeers in a mixer jar. Grind it to a smooth paste without adding any water and keep aside. 3. Put the butter in a large bowl. Add warm milk and sugar and mix till the butter melts and sugar dissolve in the milk. 4. Add the anjeer paste and mix to combine. 5. Mix together the maida, cocoa powder, corn flour, baking soda, baking powder and sieve it. 6. Mix the sieved flour to the anjeer paste and milk mixture. Fold gently. 7. In the meantime, preheat the oven at 180 Degree Celsius for 10 minutes. Grease the cake tin with butter and dust with flour. Pour the cake batter in the greased cake tin. Garnish with broken cashew nuts. 8. Bake in the oven at 180 Degree Celsius for 30 - 35 minutes. If a knife inserted in the cake comes out clean, the cake is ready. Rest in the oven for 5 minutes. 9. Invert the cake mould on a plate and allow it to cool. Cut into pieces and serve.